Both coworkers and management may have a hard time understanding these responses at first. But employers have a responsibility (ethically and under the law) to accommodate employees with this disability. Sometimes, this may mean adjusting an employee’s work schedule to less crowded hours or allowing telecommuting. Or, it might mean assigning an employee a private office – or even just an empty conference room to work in. In other situations, simply making changes to existing cubicles might work just as well. One of the most cost-effective ways to lower stress levels for employees with PTSD and increase their sense of personal security is to increase the height of their cubicle walls. 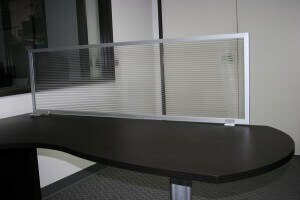 There’s a big difference in privacy between a 60” high cubicle panel and one that is 72” high. That extra foot means that no one (except perhaps a pro basketball player) will be able to poke their head over the wall to chat. Cubicle panel extensions have the added benefit of reducing noise and visual distractions that may startle a worker with PTSD. Do you have additional ideas for how to make the average workplace cubicle safer for returning warriors? Please let us know in the comments. What Kind of Cubicle Wall Stack On Tile is Best?